You don’t always need to relocate. Not so long ago, financing was no problem and new premises were easily arranged. Nowadays, efficient usage of existing space is the new creed. According to internal transportation system suppliers, it is certainly possible to increase warehousing capacity without having to make large-scale investments. It is not always necessary to build new premises to create additional storage capacity. Intelligent solutions are available that can utilize the capacity of existing warehousing facilities more effectively. In recent years, EVO (a Dutch organisation who handles the logistics interests of 30000 companies), business consultants have been studying options within companies to optimize space usage within the confines of existing buildings. Relocating to larger premises is not necessarily the first option for tackling a lack of space. There are several options for creating more pallet storage space. Drive-in racks can increase storage capacity where batches of identical goods from the same delivery need to be stored. Pallets are then placed next to and behind each other in racks to utilize the capacity as efficiently as possible. A disadvantage is that working in pallet-width channels is prone to causing damage. If this has to be performed for extended periods, then manoeuvring straight forwards and backwards becomes awkward. Although less affordable, capacity can also be increased by using more mechanization. 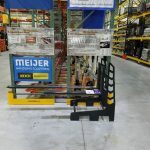 Pallet shuttles are an alternative to drive-in racks, where forklift trucks place the load on an automatic carriage at the end of the channel, which then shifts the pallet to the rear on command. By which time, the forklift truck has already left to pick up the next pallet. Folkert de Graaf from MSE-Forks in the Frisian town of Sint-Jacobiparochie has another solution. MSE-Forks manufactures KOOI-ReachForks® – these are hydraulically extendable lift truck forks. De Graaf says, ‘Now that most business owners are putting a hold on any large-scale investment, it’s worth looking at more affordable options. If you stack pallets two deep, then you’ve immediately increased your capacity. The only modification you need is to have your rack builder place two racks next to one another. Then there’s less aisle space in the warehouse and more space for storage or goods receiving/dispatch. This effectively adds a third more pallet warehousing capacity.’ De Graaf explains that telescopic forks can be easily mounted on existing forklift truck hydraulics systems. The principle is simple… pick up the pallet, drive to an empty rack location, extend the forks and place the load two deep. On the next run, another pallet can be placed in front of the pallet just placed. According to De Graaf, most forklift and reach trucks can be fitted with telescopic forks without any problem. Drivers should however take into account that the centre of gravity shifts as the forks are extended. 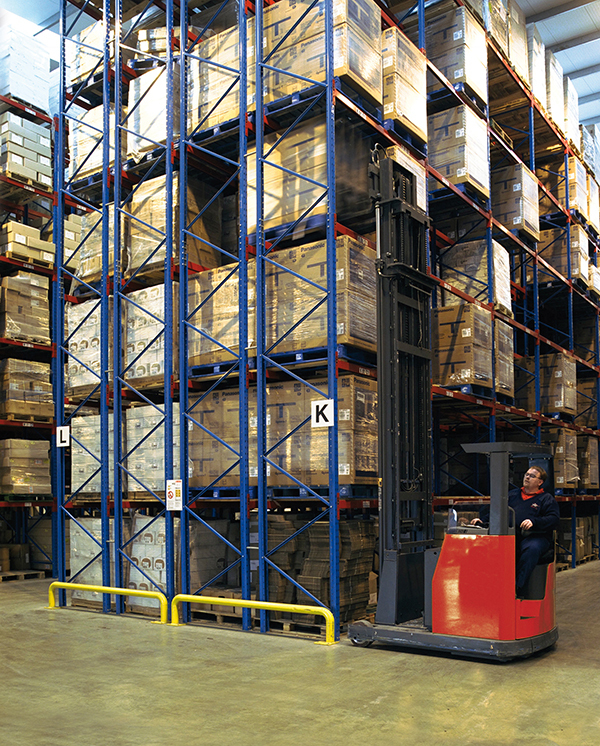 To prevent tipping, only forklift trucks with a high lift capacity should be used. Several forklift trucks have been fitted with telescopic forks at Capa Pallets in Nijmegen (NL). The company, a subsidiary of the Dutch haulage company Comelissen, inspects used pallets on arrival and, if necessary, repairs and sorts them for shipment. Sometimes, loaded pallets also need to be stored. 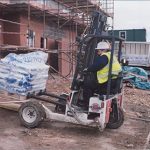 Capa’s forklift trucks are multi-purpose thanks to their telescopic forks. Pallets with loads are moved on retracted forks, but piles of empty pallets are stacked two deep on extended forks. These dual-purpose forklift trucks have more than enough lifting capacity to prevent tipping with a nominal lifting capacity of 2,000 kg for moving loads weighing approximately 800 kg. Gijs Nugteren, a forklift truck specialist at EVO, states that working with telescopic forks requires that forklift truck drivers receive proper instruction in order to comply with statutory regulations concerning specific skills requirements. Load diagrams also need to be amended after mounting telescopic forks on forklift trucks.